Firstly MANY THANKS TO GINO B.
Gino actually showed me how to do this in a Pizzeria after our evening meal. All the pictures were taken by Gino. This is Gino's page, I have basically added the text. So, once again.MANY THANKS TO GINO B. None of the pictures on this page expand. What you see is what you get. 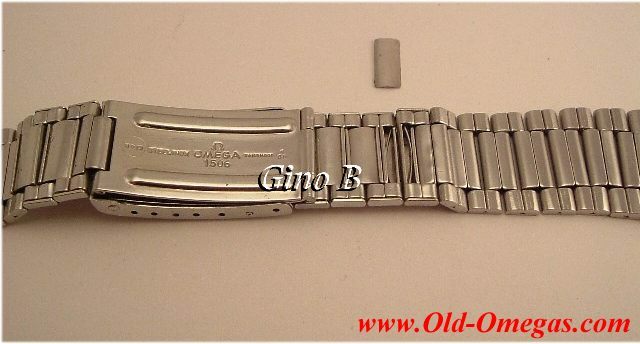 Let me start by saying that this "tutorial" covers any semi-expandable" Omega bracelet. That includes the following :- 1035, 1039, 1506, 7912. I'm sure there are other bracelets. If you know of another please let me know. Gino's bracelet is CLEAN. Is yours ? I did this on mine & even after 30 minutes in the ultrasonic cleaner, it was full of "gunge". Firstly, here are 3 pics of a link, in various states. On the left is the link as it is in the bracelet. In the middle is the link during the "addition" / "removal" process. On the right is the link in its 3 pieces. The springs are the "bowed" pieces inside the link. I do not know if it is possible to replace the springs. The "work" is done on the inside of the bracelet. Fold the bracelet back on itself as ahown here. Using your thumb nail or a wooden tooth pick, push the centre piece up. Be careful not to loose this piece ( you won't easily find another ). If you are removing a link, repeat the above for the next link. Here you can see the link has been completely removed. Re-assembly is simply the above steps in reverse. Please remember, you shouldn't need force at any stage. Once again MANY THANKS TO GINO B for taking the time to show me this & send me the pictures.